Aim Assist has always been available in the Track view but not available in its Bus pane. Aim Assist has always been available in the Track view but not available in its Bus pane. We recently made Aim Assist available in the Piano Roll View's Controller Pane so that controller data could line up easily with notes. Now by extending Aim Assist into the Bus Pane, it's easy to line up Bus Pane automation with automation or clips in Track View.. Compared to audio data, Ripple Editing is much more complex with MIDI data—but with the 2017.07 release, MIDI data joins the ripple editing club. Just remember one of the cardinal rules of ripple editing: turn it on before doing the edit (choose Options > Ripple Edit Selection or Options > Ripple Edit All), and turn it off after the edit so you don’t move clips around inadvertently. 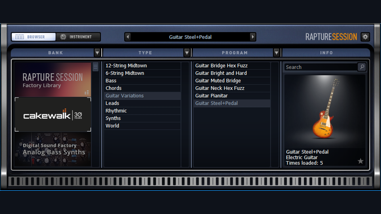 For examples of how ripple editing affects MIDI notes with Ripple All selected, view this month's Tech+Music publication! 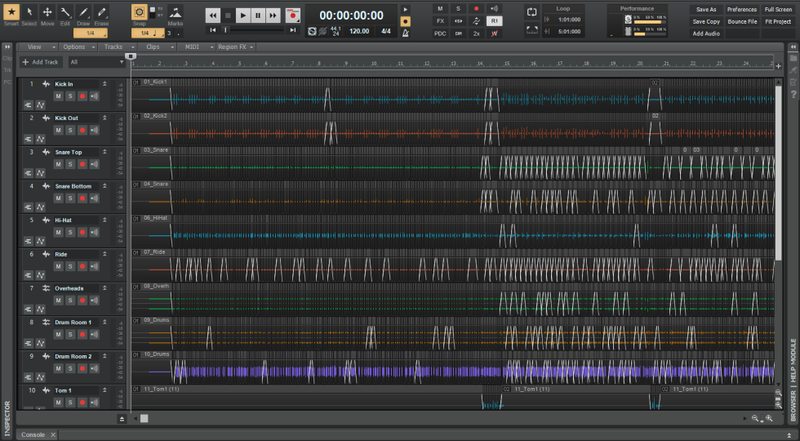 In projects with thousands of clips, SONAR’s performance can become slower if the machine can’t handle the amount of graphics being displayed. Starting with this update, users can perform tasks like split multiple clips at transients, or copy and paste loops hundreds of times, and continue to work in the project without interruptions. These improvements also affect operations such as split, move, undo, redo, ripple edit, as well as zooming and scrolling in projects with many crossfades. Undo of splitting AudioSnap beats is also much faster, and memory usage has been reduced by 75%. The benchmarks to the right compare differences between the 2017.06 and 2017.07 releases when doing operations with a project that contains 15,941 events (see below). 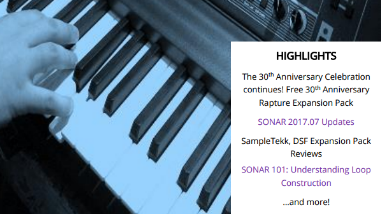 This month's issue covers the latest SONAR 2017.07 update, Clip Edit Speed and MIDI Ripple Editing improvements, reviews the SampleTekk Classic Grand Piano and Digital Sound Factory B3 Tone Wheel Organ expansion packs for Rapture, and finally brings you expert tips for creating your own DIY Sampled Piano Mods, Understanding Loop Construction, and Mixing and Mastering. 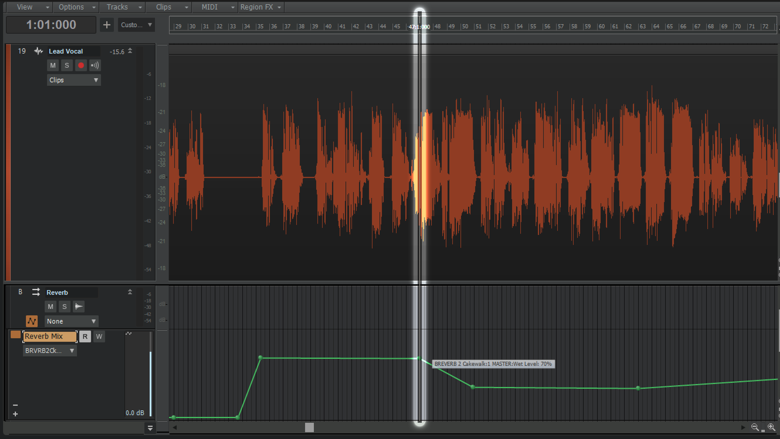 Using SONAR with a 64-sample buffer size could cause issues when 64-bit Double Precision was enabled. 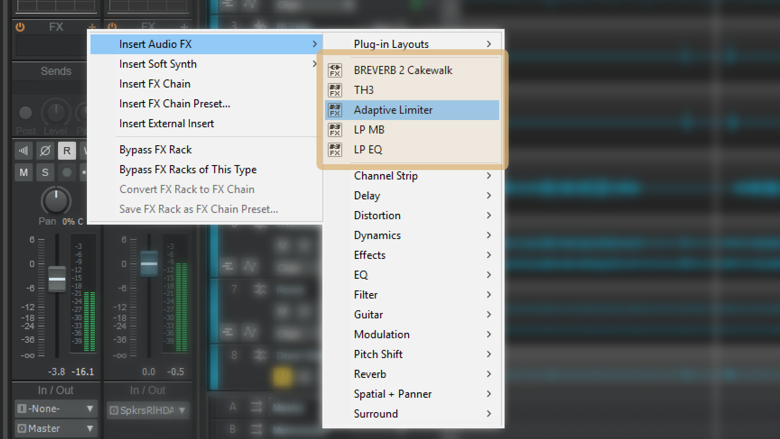 This was discovered using the Adaptive Limiter but could affect any plug-in. 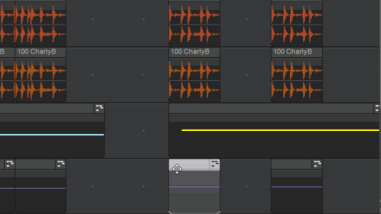 MIDI clips are no longer split in some situations. This is to help preserve clips that contain long notes.